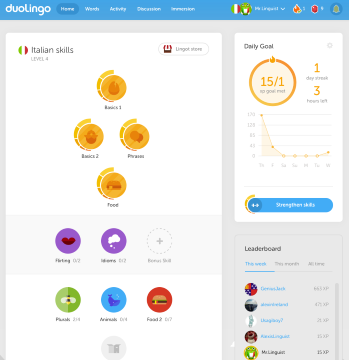 Duolingo offers their language learning platform in the form of an online website and a mobile app, both of which stay synchronized with your progress. Duolingo has received significant recognition, including iPhone App of the Year (2013) and Google’s Best of the Best (2013 and 2014). Currently Duolingo is available to English speakers for learning Danish, Dutch, Esperanto, French, German, Irish, Italian, Norwegian, Portuguese, Spanish, Swedish, Turkish, and Ukrainian. The following are in various stages of course preparation and testing: Czech, Greek, Hebrew, Hindi, Hungarian, Klingon, Polish, Russian, Romanian, Vietnamese, and Yiddish. With an international audience of over 100 million registered users, courses are offered in a great variety of primary languages as well. Uses native speakers to help develop accurate pronunciation. Both the main course and their flashcards make use of spaced repetition to help solidify acquisition and retention of vocabulary. Every exercise provides immediate reinforcement or correction. As you move through the lessons, you accumulate credits in the form of “lingots” which may be used to take placement tests, test out of specific units, and a variety of other incentives for motivation. Progress tracking is very graphic and clear. Strength indicators are used to indicate areas in need of review. Some grammatical points are explained, but you need not read the explanations if you prefer to simply learn via the exercises. Duolingo offers a limited form of “immersion” in the form of providing documents for translation. Live tutoring is not a part of Duolingo. You can only use Duolingo while connected to the internet. While pronunciation is a part of the program in the form of listen and repeat exercises which are then evaluated by vocal recognition, I found I had to speak unnaturally slowly and distinctly for the program to recognize my words. It would be difficult to learn conversational skills solely by using Duolingo. There is no means for direct question and answer available. I would say Duolingo is aimed at beginning through intermediate language students. It would be especially on target for those desiring to develop and practice translation skills. from English to Spanish, translating a sentence from Spanish to English, transcribing a sentence from spoken Spanish, matching words with their meaning, choosing word meanings by multiple choice, supplying the missing word in a phrase or sentence by multiple choice, and so on. Support is provide through online discussion threads whereby the community of those studying a given language respond to each other. Free – No other options! 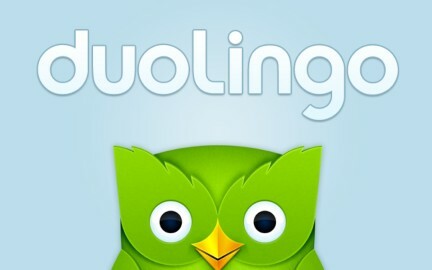 I found Duolingo to be addictively fun! The lessons are short, and can be used as a break from other tasks. And it is free. So, while it has some limitations as a stand-alone language course, I would encourage anyone to at least try it out as one component of their language study. What a great tool for getting started on learning a new language. It does seem quite a simple program to use, and for free, how could a person complain??? Are you able to expand on which languages it covers? This might spare me having to look it up and find they do not have the language I want…Mandarin. Thank you for taking the time to put it up for review. Ultimately, the free part is hard to pass up right?! Perhaps after an initial start with this, moving on to another harder language program would be in order. Thanks for getting back to me David, I will be waiting for the addition of the Mandarin. Cindy, It’s good to hear from you again. While Duolingo is not yet available in Mandarin, many other products are, including: Rocket Languages, Pimsleur, Rosetta Stone, ITalki, and most of the other products cited in this article. 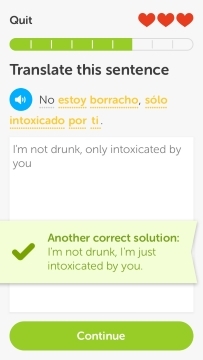 I found Duolingo an interesting learning language. Besides it is free, I can also access it through mobile phone. The fact that they will provide exercises to check how you learned is a great tool to encourage everybody to use this site in learning languages. This is a great post and very highly recommended to all. Thanks for sharing this review. This was a very comprehensive review. Thank you for all of your insights. Duolingo looks to be quite a great deal for a free resource! There aren’t many of this quality out there anymore, are there? If you say this takes you through an “intermediate” level, do you have suggestions for next steps? Next steps will likely depend on your intended use of the language. If your intended use is conversation, you may simply need to practice engaging in conversations. If you intend to study or do business in your new language, you will have some specialty vocabulary to learn. If your primary use is translation, you may wish to use Duolingo’s “Immersion” tab to practice and improve your translation skills. By this stage in your language development, you would hopefully have a clear idea of what steps remain to reach your intended level of proficiency. Hi David, I’ve been looking for a good app to download for my daughter who is interested in learning French. Mostly she just wants to learn some of the more common words and phrases in the language and isn’t necessarily looking to become fluent. After reading your review, this looks like a perfect start for her. I downloaded it today so we’ll see how she does! I’m glad to hear your daughter is interested in learning a new language. It does sound like DuoLingo is a great place for her to start. There are many other helpful resources reviewed on this site that you might consider in the future. If you have specific needs, feel free to send me an email at David@talkwithmyneighbor.com. I have used Duolingo a few times before and I would say this is a very good review of the app. The game-ification of learning language and the reward system is definitely very motivating. And the fact that the little bars disappear over a period of time keep you revising and refreshing your memory. Exactly! Without saying Duolingo is ‘the best,’ I have to say that I’ve found it the most motivating language learning system I have used so far. It’s sort of addictive; you want to do “just one more” or to reach that new level. 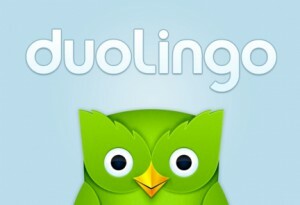 Duolingo sounds like a lot of fun, I would love to learn French and maybe a little Spanish. I guess one cannot really complain if the product is free and community support sounds like a great feature. I also think it’s fantastic you can learn in your own time and at your own pace. I’ll definitely get the app! Enjoy! Duolingo is very fun. Then, if you decide you’d like to focus more on listening and speaking your new language(s), check out some of our other language learning reviews.